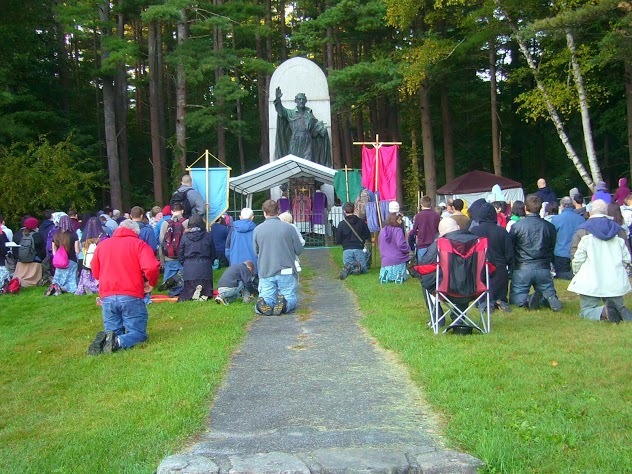 Pilgrims of all ages walk in `brigades’ (groups of 20 to 35), under a patron saint. Brigades are formed by laymen under the leadership of chaplains. Pilgrims live according to the mandate of Our Lord and the fellowship of the Holy Ghost – friendship & prayer sustaining each pilgrim on his spiritual way. There is ample time to pray, sing & comport with fellow pilgrims, and plenty more time for quiet moments in personal prayer and reflection along the way. The Rosary of Our Blessed Lady is recited often during the three day journey, so bring your rosary beads! The sacred Clergy preach, teach and are ready throughout to hear confessions and give private spiritual counsel. In these 358 words the attentive reader will come to know the spirit & mission of pilgrims for restoration: i.e., the ‘spiritual DNA of the Thirteenth Apostle’, and why he remains ever linked to the First Among Them. In a word, why we are Roman. Holy Mass is prayed in the early morning the first two days, before step-off. The Crowning Mass is prayed in the afternoon on the last day, this year again in the Coliceum church of the Martyrs of New France at the shrine in Auriesville. The form of Mass used throughout the pilgrimage is the traditional (western) Roman Rite, also known as the forma extraordinaria in accordance with Pope Benedict the XVI’s motu proprio, Summorum Pontificum. Glorious instrument of prayer & sacrifice, the traditional Roman liturgy stresses the universal character & mission of holy Church. Holy Mass is celebrated in a most solemn manner at the crowning Mass on Sunday. I, (name), a faithless sinner, renew and ratify today in thy hands the vows of my Baptism; I renounce forever Satan, his pomps and works, and I give myself entirely to Jesus Christ, the Incarnate Wisdom, to carry my cross after Him all the days of my life, and to be more faithful to Him than I have ever been before. In the presence of all the heavenly court I choose thee this day for my Mother and mistress. I deliver and consecrate to thee, as thy slave, my body and soul, my goods, both interior and exterior, and even the value of all my good actions, past, present and future; leaving to thee the entire and full right of disposing of me, and all that belongs to me, without exception, according to thy good pleasure, for the greater glory of God, in time and in eternity. Receive, O benignant Virgin, this little offering of my slavery, in honor of, and in union with, that subjection which the Eternal Wisdom deigned to have to thy maternity, in homage to the power which both of you have over this poor sinner, and in thanksgiving for the privileges with which the Holy Trinity has favored thee. I declare that I wish henceforth, as thy true slave, to seek thy honor and glory and to obey thee in all things. O admirable Mother, present me to thy dear Son as His eternal slave, so that as He has redeemed me by thee, by thee He may receive me! O Mother of mercy, grant me the grace to obtain the true wisdom of God; and for that end receive me among those whom thou lovest and teachest, whom Thou leadest, nourishest and protectest as thy children and thy slaves.